Taking delivery of the box it is apparent that your money has not been wasted on a fancy decorated box. The only identifying information was a small label on the side of the box which can be seen in the photo opposite. Yes indeed the box is minimal with all the markings necessary, saving the best part for opening the box. 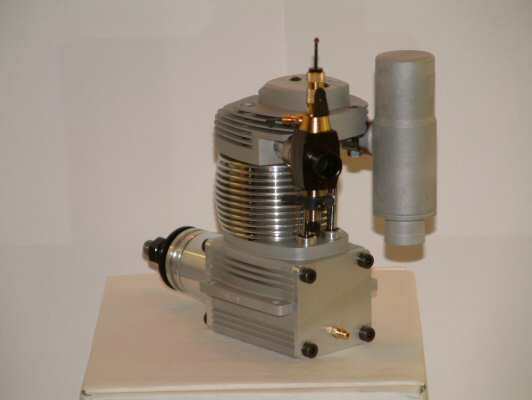 This is my first 4 stroke engine having previously been a dedicated OS 2 stroke owner. Inside the box there is a large amount of plastic bubble wrap, internally wet with oil for safe storage of the engine. Not very much assembly required with the muffler and carb to install. 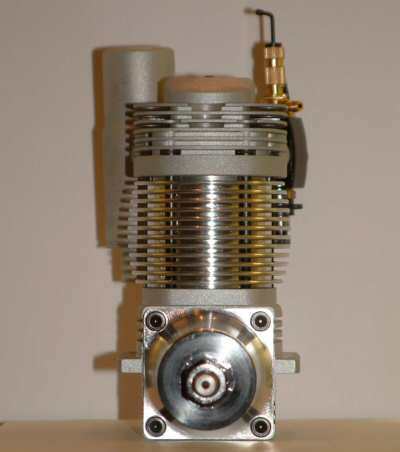 Every Laser engine is tested at the factory so we know the carburetor is set up correctly. Instructions are on 2 sheets of A4 which are also available from the web site.In terms of size the engine is rather compact for it's class which is important when building a scale model. In discussion with Neil he commented that the engine would be a little proud of the cowl, but only by 10 mm or so. In his opinion the 150 is preferable for the 1/6 scale Spitfire when flying from a grass field as I will be doing. The carb is nice and compact sitting in direct line of the intake. This is one of the design features of the laser engine. Note also the Push rods are mounted at the rear of the engine to provide a little more protection for the engines moving parts.Hopefully I will not have to put that feature to the test! The carb is nice and compact sitting in direct line of the intake. 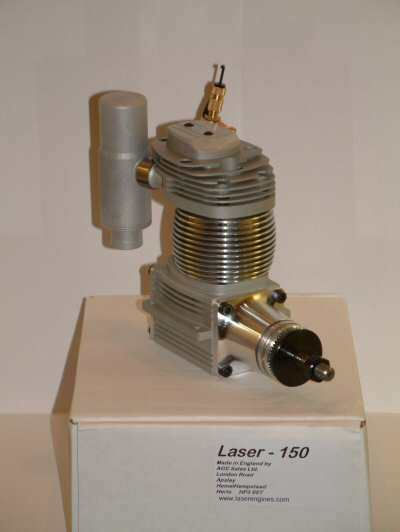 This is one of the design features of the laser engine. Note also the Push rods are mounted at the rear of the engine to provide a little more protection for the engines moving parts. Hopefully I will not have to put that feature to the test! The rear plate is a flat slab of metal where the crank vent is located. 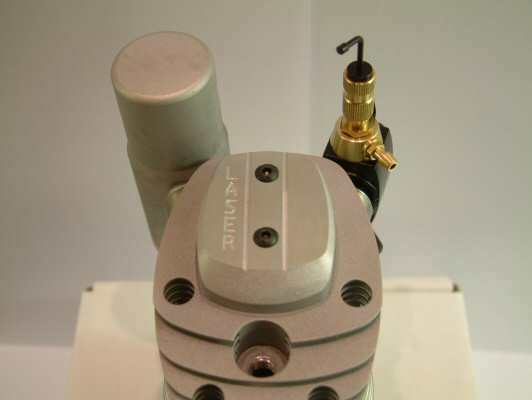 Regular lubrication is required in the crank every 3 hours running with 3-5ml low additive SAE30 oil. The cylinder head is clean with the famous Laser name machined into the rocker cover.This engine constructed out of metal blocks that are CNC cut to give maximum strength to the engine. This is a beautifully constructed motor. 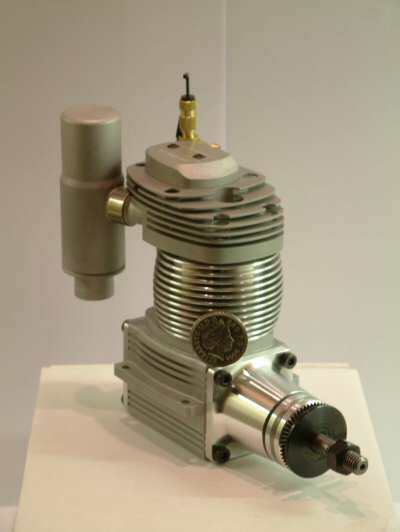 From the front the engine shows a slim profile with not too much height or vulnerable protrusions except for the carburetor needle valve.